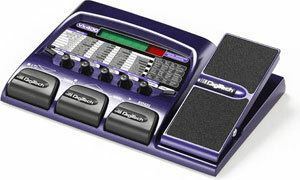 The Digitech studioquad appeared on the market a few years ago and was taken out of production in 1999 when replaced by the Digitech Quad four. When the studioquad came out on the market it created quite a stir in the homestudio musician communition presenting a four in and four out multieffect solution at a price of around 500 bucks. I myself had long been in need for some effects at the time it appeared on the scene and had a hard time choosing between the standard of crop of multieffects available or a to buy two cheaper dedicated units. Then of course the was the dreammachine Ensoniq DP4+ which costed a bit over 1200 bucks which I could not afford. So after reading the terrific reviews the studioquad got in magazines like The Mix and Fututre Music I decided to get one. The Studioquad quickly became a success as the poor mans DP4+, and don't be surpriced to see it in a struggling musicians arsenal. Enough of history and to the machine itself. 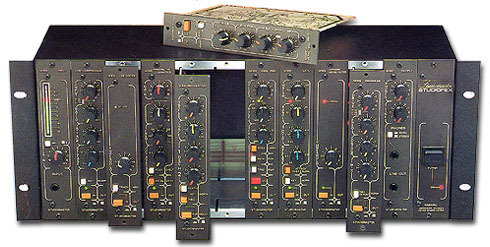 The Digitech Studioquad had for inputs and for outputs so it can process 4 mono signals or 2 stereo or any combination and feed them out just the same. 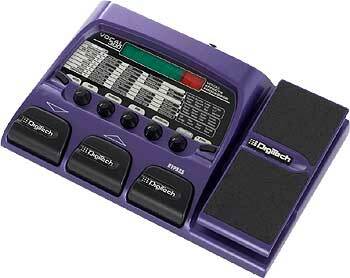 It has a modular system to it software also in teh way you set its effects up. You can either spend all its processing power on one big quality effect or divide it up on more effects of less complexity. This means that you can either choose something like a lush and grand stereo reverb or a phaser and a reverb for one signal and a delay and chorus for the other three. There is lots of flexibilty to it. As for the quality of the effects I think they are good bread and butter kind. They are the standard 48khz with 24bits internal processing and sound good to me. They will work with you standard synth and give you that extra reverb for the strings or percussion. The delaytimes are a bit short and works best with 90bpm tempos and upwards. There is a good selection of effects in the machine like phaser, chorus, eqs, reverbs and delays, but there is no distortion or vocoder algorithms. Many parameters can be tweaked in realtime using midi and there is also a pair of LFO's for continuos control(good for unusuals ping-pong type delays). For editing the machine has a few buttons and one alpha dial. This may seem a bit oldfashioned compared to the modern syths like say the Supernova from novation, but lets face the facts - this is mostly the way it is with effect boxes and it works good. It works better with the Studioquad than with other machines I have tried beacuse the display is rather big and displays graphical symbols where they are in place and digits when they are not. The Studioquad is a cheap bread and butter machine that can do many things for your sound , but don't expect top of the notch TC electronic or Lexicon quality reverbs from it. If you have a synth like say a Roland JD990 or a few cheap analogs like a Deepbase9 or Cheetah MS6 and need to add a bit of delay and reverb or perhaps some strange phasing too this machine can deliver and do it to up to four sounds at a time. But before you buy one be sure to check out all the new alternatives cause this machine may have gotten the snowball of cheap multieffects rolling, but things have gotten better and there is no retro value to having the Studioquad cause it is not the minimoog of multieffects.